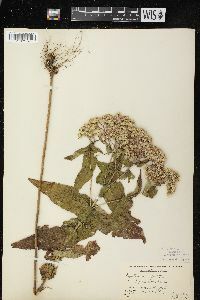 Perennials, 40-100+ cm. Stems (from short caudices) single, sparsely branched distally, puberulent throughout. 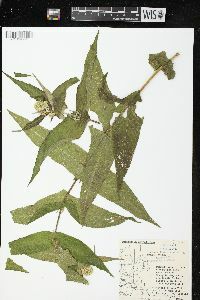 Leaves usually opposite (sometimes whorled); sessile; blades pinnately nerved, oblong (tapering toward apices), 50-150+ × 15-40 mm, bases connate-perfoliate, margins serrate, apices acute, faces pilose, gland-dotted (abaxial), glabrate, not gland-dotted (adaxial). Heads in corymbiform arrays. Phyllaries 7-10 in 1-2 series, oblong, 2-4.5 × 0.6-1 mm, apices (whitish) acute to acuminate, abaxial faces villous or puberulent, gland-dotted. Florets 7-11; corollas 2.5-3 mm. Cypselae 1.5-2 mm; pappi of 20-30 bristles 3-3.5 mm. 2n = 20. Flowering Aug-Oct. Moist, low ground, marshes, roadsides, swamps, wet pastures; 10-500+ m; Man., N.B., N.S, Ont., P.E.I., Que. ; Ala., Ark., Conn., Del., Fla., Ga., Ill., Ind., Iowa, Kans., Ky., La., Maine, Md., Mass., Mich., Minn., Miss., Mo., Nebr., N.H., N.J., N.Y., N.C., N.Dak., Ohio, Okla., Pa., R.I., S.C., S.Dak., Tenn., Tex., Vt., Va., W.Va., Wis. Eupatorium perfoliatum is both distinctive, with its perfoliate leaf bases, and extraordinarily widespread. 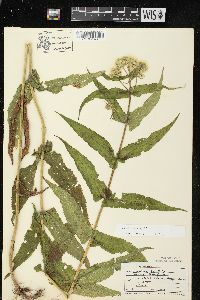 Hybrids between E. perfoliatum and other species of Eupatorium have been reported. 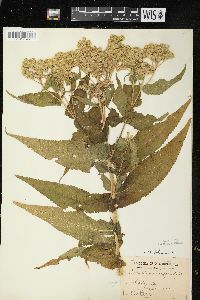 The name E. resinosum var. 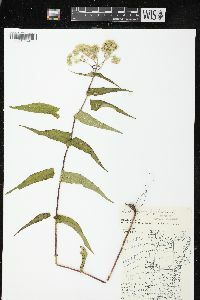 kentuckiense Fernald is based on hybrids between E. perfoliatum and E. serotinum (= E. ×truncatum Muhlenberg ex Willdenow). 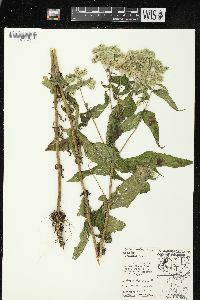 Eupatorium perfoliatum var. colophilum refers to populations characterized by narrower, more leathery leaves found in the extreme northeastern portion of the range. Frequent to common in all parts of the state in low ground in woodland, pastures, and fallow fields and along ditches and roadsides. 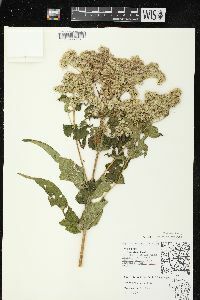 The tops and leaves were formerly an official drug and the pioneers freely used a warm infusion of it as a diaphoretic. 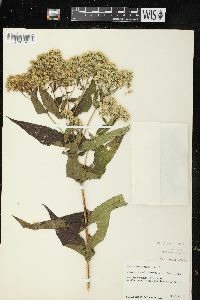 The leaves and flowers are variable and these variations have been named. I have included all forms in the one map. 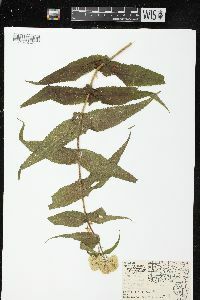 [The leaves of var. 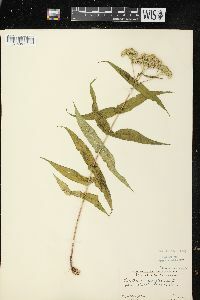 cuneatum are] smaller, narrowed at the base, and separate; heads fewer-flowered. I found it along a moist, sandy roadside in Newton County about 2 miles north of Lake Village. Stems 4-15 dm, conspicuously crisp-villous with long spreading hairs; lvs opposite (very rarely ternate), broad-based and strongly connate-perfoliate, tapering gradually to the acuminate tip, crenate-serrate to the base, 7-20 נ1.5-4.5 cm, sparsely pubescent or subglabrous above, more evidently hairy beneath; infl flat-topped; invol 4-6 mm, its bracts imbricate in ca 3 series, the outer less than half as long as the inner, mostly obtuse, the inner more acuminate and often pale distally; fls 9-23 per head, dull white; 2n=20. Moist or wet low grounds; N.S. and Que. to n. Fla., w. to N.D., Neb., Okla., and Tex. July-Oct. Estuarine plants from Me. and Que. avg narrower-lvd than var. 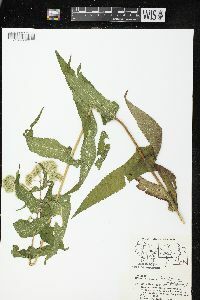 perfoliatum (as described above) and have a sparser, shorter, and stiffer pubescence; these are var. 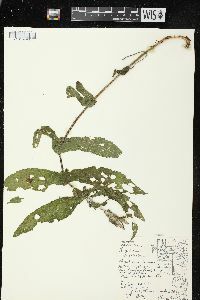 colpophilum Fernald & Griscom. Forms with purple fls, form with ternate lvs, and forms with the lvs not connate have been observed.